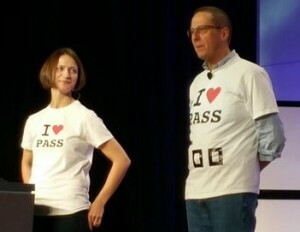 As an attendee at PASS Summit, I had the opportunity to learn about a wide variety of topics, including public speaking. I’ll be devoting other blogs to the great technical things I learned, but I thought I would start by talking about the sessions in general. I saw a number of presentations, some which went well, others which were beset by technical difficulties. By far the best talk I saw was the keynote with Rimma Nehme and David DeWitt of Microsoft. The presentation was well rehearsed without sounding canned, and the slides were absolutely amazing. You can check out the slides here as they are publically available. I am going to remember what made this talk work, and hope to incorporate what I saw here when I speak next. If you are interested in where that will be, check out my Engagement page as maybe we can meet sometime. I saw a number of different speaking techniques employed at Speaker Idol. People were really creative. Todd Kleinhans navigated through a game interface. Wes Springbob did an homage to Hitchhiker’s Guide to the Galaxy. By the way, if you haven’t read the series, I think you should as they are great books. I was surprised that all of the judges hadn’t read the books, but even those who didn’t thought he gave a great talk. I demonstrated that I had never used a microphone before, which was not positive. Bill Wolf worked to engage the audience throughout his talk. Ed Watson videotaped his demo. This technique is something that often I have heard that you should do in case your demo crashes, but this was the first time I have seen anyone who actually did record the demo. William Durkin brought great stage presence, which I noticed was a common theme among all of the talks I liked. Effective presenters know their topic so well that the talk should appear effortless and fun, without appearing that a script has been memorized that you are working to run through. Also, remember to have a point to follow during the presentation so I remember what the talk was about midway through. Everyone who did this I thought did a great job. The finalist for Speaker Idol were William Durkin b | t , Theresea Iserman t, and David Maxwell b | t. My name was not there, due to my issues with the microphone, which put me off my game. Also despite my goal of not adding useless words, I threw in many “um” and “so” into my talk. In my round, William did the best job, so it was logical that he went forward. I talked to David and Theresa about their respective talks, and I know they put a lot of work and practice making them really good. David was the winner, so I look forward to seeing him at PASS Summit 2016 giving the talk of his choice. As for me, I hope to follow the pattern of fellow Speaker Idol 2014 non-winner Reeves Smith b | t who spoke at PASS Summit for the first time this year the old-fashioned way, by picking a good topic and writing a good abstract for it.